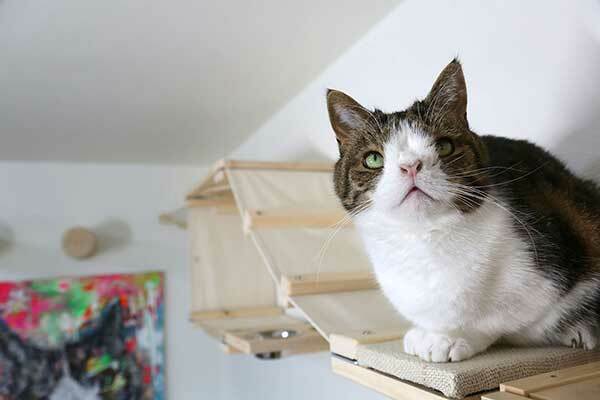 There are many things to consider when building your cat the perfect habitat of their own. Here are some tips to get the best piece of furniture for your space. Which room you install the furniture in can depend on how social your cat is. Do they hang out in rooms with you or like to be on their own? Keep this in mind when deciding the place to create their space. Is your cat old and slower or young and agile? This is important for spacing and the type of furniture you get. 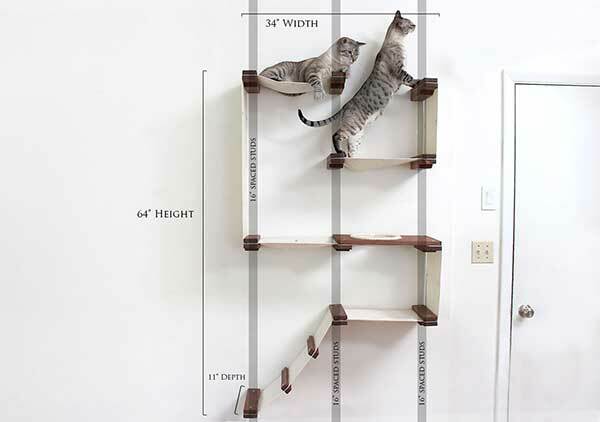 If your cat isn’t very agile, then you might want to consider shelves, because they are a little easier to walk on than the hammocks. Do you have multiple cats? For homes with multiple cats, we suggest making sure there are multiple routes around the layout to avoid altercations. 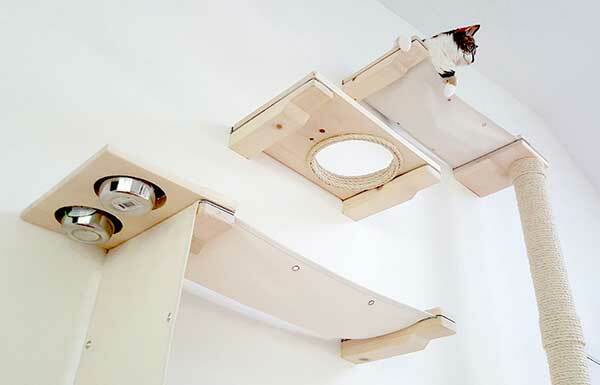 We typically suggest giving cats a route up the wall or to an endpoint like a feeder or a bed. A lot of our complexes are built with this already in mind, but if you’re building your own layout keep in mind that in a lot of cases a cat needs motivation like food or a comfortable napping spot to traverse a route. We have multiple cats and try to avoid dead ends where we can. We think they feel more comfortable knowing they have multiple escape routes if approached by another cat wanting to paw at their face during a nice nap. Don’t feel limited by corners. We have shelving built to connect paths around them. Doors and windows are the perfect place for a cat bridge. 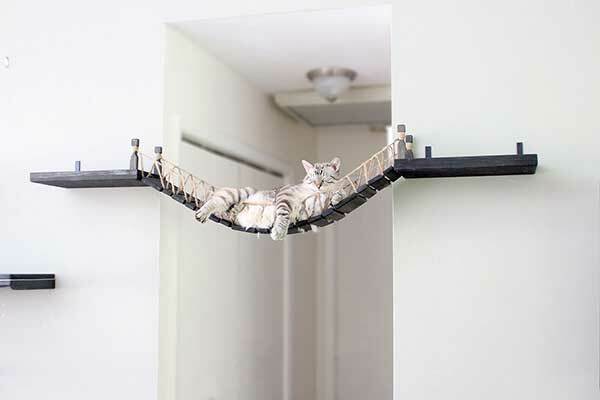 Mounting a bridge in a doorway or window to connect a gap in your pathway gives your cat something interesting to watch while lounging. We custom-build the bridges to fit the doorway or window it’s being mounted along. Studs are the wood 2×4’s behind drywall in most modern homes. Every wall-mounted piece we sell is built to be installed into at least one wall stud. Most homes have 16″ studs, so that’s what we build our designs for. If you have other spacing, like 24″ studs, the Cat Mod collection would still work for those. Before deciding what to order, measure your studs using a stud finder and count the number of studs in the area you want to use. It can be helpful to take a picture and then annotate it with the stud locations and distances. All of our listings say how many studs the pieces need to mount on.